"Praxis Ratgeber: Mantiden - Faszinierende Lauerjäger"
This german book is recommended for all beginners, but also for advanced. 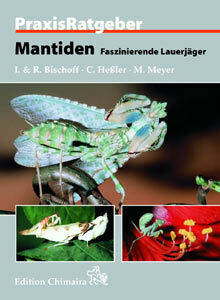 It contains helpful tips, general hints and information about the living and behaviour of mantids. A huge part attends to species- descriptions about frequently kept and bred species. 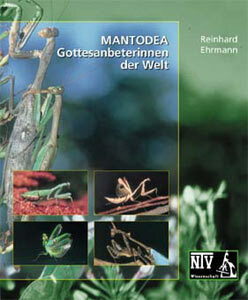 "Mantodea - Gottesanbeterinnen der Welt"
This book is scientific work, which contains systematics, living and behaviour of mantids. It does not contain any species descriptions. But it describes the systmetic of many species and genus. Accordingly many pictures of rarely species complements it.